There’s a story in the Bible that really intrigues me, the story of David and Goliath. Whenever I have “giants” in my life, whenever things seem too big for me to handle, I think about how God used David against all odds. Everybody told David that he couldn’t battle Goliath, that there was no way he could beat him. They didn’t fully believe in God’s power and capabilities… but David heard the blasphemy that Goliath was speaking against the Lord, and he was not accepting it. When Goliath told David to “Come here and he would feed [David’s] flesh to the birds and wild animals,” David said “You come against me with sword and spear and javelin, but I come against you in the name of the LORD Almighty, the God of the armies of Israel, whom you have defied” (1 Samuel 17:44-45). All it would take is faith in what the Lord could do. David, the youngest son of Jesse, who seemingly had no special qualities about him, beat an almost-10-foot-tall giant… with one small, smooth stone. Really think about that and try to wrap your mind around it – it’s so amazing! Do we approach the “giants” in our life with the same faith that David did? There’s another part of this story that I think is so cool, and that’s the fact that when David’s stone hit Goliath’s forehead, he didn’t fall backward. He fell face first to the ground. I’ve always wondered why that was. Didn’t that contradict the laws of physics? I think it’s because if Goliath had fallen backward, David would have gotten all the glory. 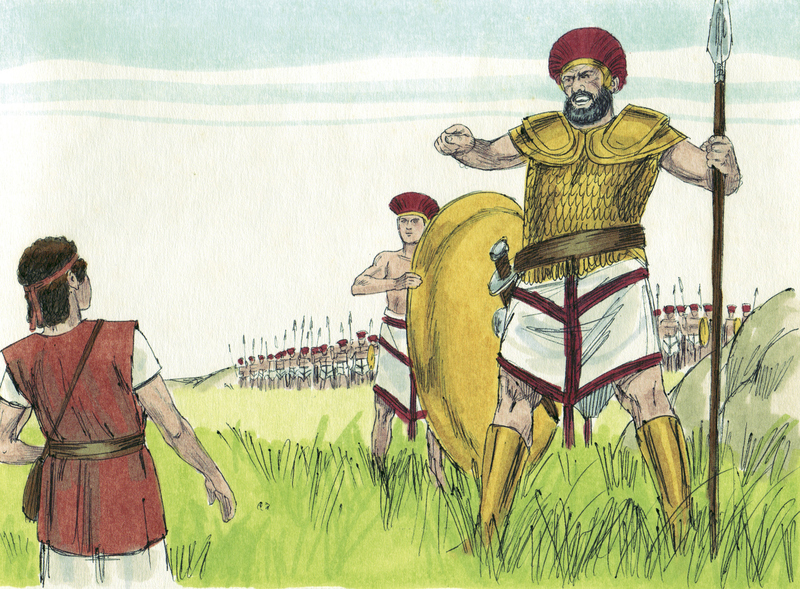 People would assume that Goliath was killed by David’s strength. By Goliath falling forward, it proves that it was the LORD that conquered. The Lord got all the well-deserved praise and it was His people that won the war against the Philistines. Nothing is too hard for the Lord! Great article Erin! Im facing a giant right now. My grandson born yesterday has some health issues and needs prayer, as do my son and his wife. God has brought us through many trials in our lives (I lost a 15 year old son to brain cancer in 1995, lost my wife of 42 years last Aug. when she was struck by a hit and run driver on drugs), I had prostate cancer and now have Parkinson’s) among other trials as well. Through it all, God has been faithful and full of grace! We have had a close relationship with Jesus for 43 years and our lives have been full of joy. That will never end, all glory to God! But those giants do come and we have to face them and not hide and cower. So we pick up the smooth stones of prayer and let the Lord guide us as we fight these battles on our knees. Thanks for letting God use you to encourage us, the little Davids. As I read your article I was reminded of the Casting Crowns song Voice of Truth. God bless you Erin. P.S. I love that song!! !